If this pattern (some kind of a double bottom followed by a strong rally) continues to happen we should see a gap up tomorrow. Looking at the past days, the decline from 1119 to 1086 looks a bit like a diagonal. But unfortunately this doesn't really help because it can either be a bullish ending diagonal or a bearish leading diagonal (only FED knows which one's the correct one : )). 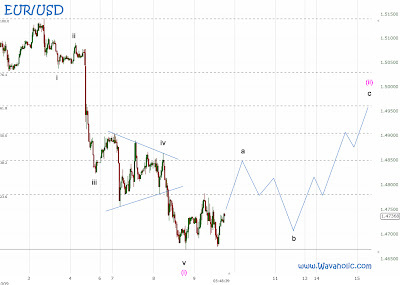 EUR/USD: The EUR/USD completed five waves down and is now in a corrective wave (ii), which might correct all the way up to the 62% retracement level. 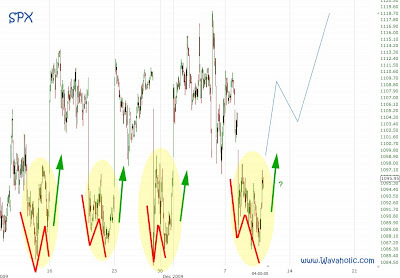 A weaker dollar (rising EUR/USD) in the next few days would also support my SPX count suggesting a rally in the stock markets as I don't expect that the correlation will suddenly stop today or tomorrow.